This short package includes two of the very best full day excursions up the Swiss mountain railway: Mt. Titlis and Jungfrau Joch (Top of Europe). You will stay 2 nights each in Lucerne and Interlaken which are connected with the Golden Pass train, one of Switzerland's scenic trains. For the Mt. Titlis excursion you will travel to Engelberg by train and then take the revolving cable car up to Mt. Titlis. The excursion up to the observatory on the Jungfrau Joch is all on train or cogwheel train. 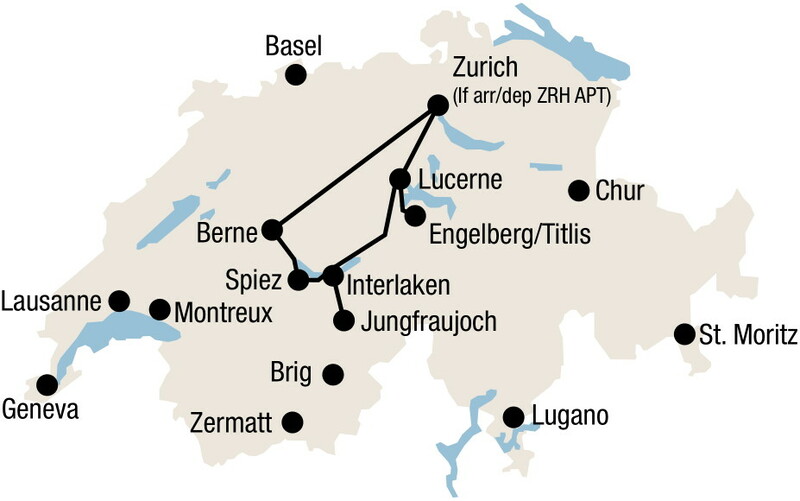 Your tour starts and ends at any airport or city in Switzerland. This Top of Europe Titlis Tour package includes all rail transportation, overnights in 3 or 4-star hotels with breakfast, and the mountain excursions to Mt. Titlis and Jungfrau. Runs all year around. Excursion from Interlaken up to the Jungfraujoch – Top of Europe. The ¬highest railway station in Europe is located at 3454 m/11’333 ft. Visitors have access to a high-Alpine wonderland of ice, snow and rock, which they can admire from the viewing platforms on the Aletsch Glacier or in the Ice Palace. The Swiss mountain railway journey to the Jungfraujoch is an experience which leads through the Eiger and the Mönch. At the Eismeer and Eigerwand intermediate stations, visitors can enjoy the beautiful view from the Eiger North Face. Overnight in Interlaken. Rail journey over the Brünig Pass to Lucerne. Overnight in Lucerne. Excursion to Mount Titlis – at 3020 m / 10’000 ft. From Lucerne the train takes you up the Swiss mountain railway to the mountain monastery village Engelberg where you board a gondola which takes you up to the Trübsee. You continue your Top of Europe Titlis tour by traveling up another gondola to Stand and finally the first revolving Titlis Rotair cablecar takes you up to Mount Titlis. For a spectacular, close-up insight into a glacier, visit the glacier cave and ride the Ice Flyer chairlift. And get your thrills on the TITLIS Cliff Walk, a spectacular Suspension bridge at a height of 3041 m/10'000 ft. Overnight in Lucerne. Travel back down the Swiss mountain railway to return to the Swiss border or airport, or continue your stay in Switzerland at your own request. Mount Titlis: Maintenance work November 4 – 15, 2019. Mount Rigi: Maintenanace work March 25 – April 18, 2019 and November 4 – 15, 2019. Mount Pilatus: Golden Round Trip is only bookable from mid-May to mid-October, 2019. Swiss Transfer Ticket Combi: Top of Europe and Titlis Tour (5 transfers) incl. excursions to Jungfraujoch and Titlis in 2nd class from/to Swiss border or airport. 2 nights in Lucerne, standard room with private facilities, breakfast.